Boyapati Chandrasekhar and Anjan Padmashali. "Modelling of 200W LED Driver circuit design with LLC converter." Journal 4 Research 2.2 (2016): 1-7. Varsha Sadashiv khenat, Puja Gajanan Dhalpe, Navin Dube, Varsha Sadashiv khenat and M.R.M Veeramanickam. "Securing Digital Images using Watermarking Technique And Triple DES Algorithm." Journal 4 Research 2.2 (2016): 8-13. Dipali Pandya, Dhaval B. Shah and Ravi Soni. "Design Modification and Analysis of Fixture to Accommodate Different Steam Turbine Casing." Journal 4 Research 2.2 (2016): 14-21. Pradip Fultariya and Tejendra B.Patel. "Assessment of Correlation for Condensation Heat Transfer through Mini Channel." Journal 4 Research 2.2 (2016): 22-25. Prof. Samir Kumar Bandyopadhyay, Soumi Sarkar and Taniya Seal. "Sentiment Analysis-An Objective View." Journal 4 Research 2.2 (2016): 26-29. Prof. Samir Kumar Bandyopadhyay and Ghazaala Yasmin. "Detecting Facial Expression in Images." 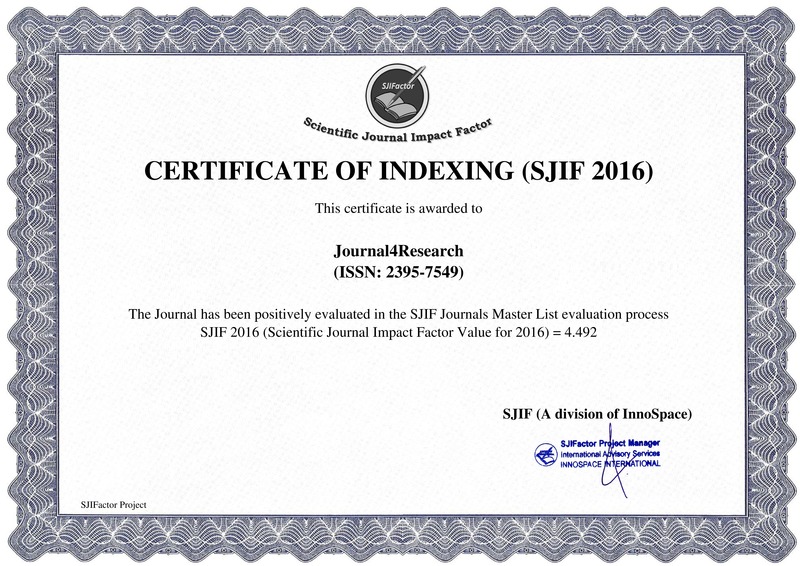 Journal 4 Research 2.2 (2016): 30-41. Jigneshkumar V Madhad and Piyush Patel. "Comparative Study of IP Traceback Techniques." Journal 4 Research 2.2 (2016): 42-47. MANJU ELIZABETH MATHEW, JUNIDA GEORGE, SMILA MATHEW and SANDRA ELSA THOMAS. "Colour Lock System For User Authentication." Journal 4 Research 2.2 (2016): 48-52. Rahul Ganpat Ghodake and A. O. Mulani. "Sensor Based Automatic Drip Irrigation System." Journal 4 Research 2.2 (2016): 53-56. Anju Dhir. "Biosensors- Analytical Device." Journal 4 Research 2.2 (2016): 57-60.